Bad breath (or halitosis) is an unpleasant odour which can occur from time to time or be long lasting. Halitosis can be embarrassing so if you think you might have this problem then please come and see us at Werribee Dental Clinic. We can provide you with a diagnosis and a treatment plan if required, to get your breath smelling nice and fresh once more. Temporary bad breath can be due to eating onions or garlic, or another highly flavoured food and in this case you will need to wait for the food to be eliminated from your body. More persistent bad breath usually results from a problem in your mouth. We have millions of bacteria that live in the mouth, particularly on the back of the tongue and these bacteria feed on the food debris that accumulates in the mouth and between our teeth. The bacteria give off a sulphur compound and it is this that creates an unpleasant odour. Smoking and drinking alcohol can both contribute to halitosis. There are other conditions which affect the airways and stomach that can lead to bad breath too. 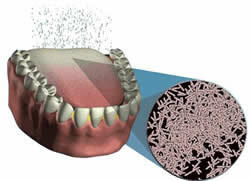 Improving your oral hygiene is the most effective way to eliminate bad breath. Brushing your teeth and tongue twice a day using fluoride toothpastes, as well as flossing, will remove the bacteria which generally causes the odour. If you would like some advice and practical help on brushing and flossing then please just ask us. We are always delighted to help our patients improve their dental knowledge and often being shown a few simple techniques on how to brush and floss more effectively can make the world of difference to your oral health and to your breath.